I am President Goodluck Jonathan. I am conversant with world news and have found your high repute, trustworthiness and contact details through personal research. On the 21st of June 2012, a Mr. China, his wife and their extended relatives were involved in a fatal car accident along Lagos – Ibadan express road. I repose great confidence in you, as you share the same surname, that you can help repatriating their 200,000 barrels of crude oil before they get confiscated or declared unserviceable by the bank. This sounds like a great opportunity! Almost too good to be true 😀 Please tell me more. I repose great confidence in you. I have secretly deposited a key to the oil in a metal box consignment with Security Deposit Number 00SUCKER56. I have all necessary legal documents; all I require from you is your pin number, naked photos of your wife and $1.7bn of infrastructure contracts. Once the money is transferred, phone me on 0766GFk$722. This will be a source of upliftment to me and you also. A Mr G.Osborne (of 11 Downing Street) has also been identified as having invested the UK’s gold reserves in a Russian mail-order-bride scam. I sent the Prince of Nigeria my bank information to help them transfer money to my account. I even gave them a loan. I never heard back. Are you sure this isn’t a scam? But it seemed so plausible! Big hugs, The Xi Man… brilliant. Just brilliant. 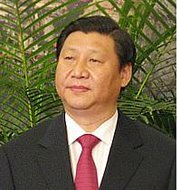 This entry was posted on July 25, 2013 by Wrenfoe in International News and tagged China, Email Scam, Flib News, Goodluck Jonathan, Ngozi Okonjo-Iweala, Nigeria, Nigerian 419, President of the People's Republic of China, Satire, Xi Jinping.